The use of staggered polepieces on pickups is surrounded by a lot of 'myth and magic' that it does not really deserve, though undoubtedly, a set of ‘vintage stagger’ polepiece pickups has great visual appeal at least. The concepts driving this are actually very simple, and this article seeks to illustrate that. 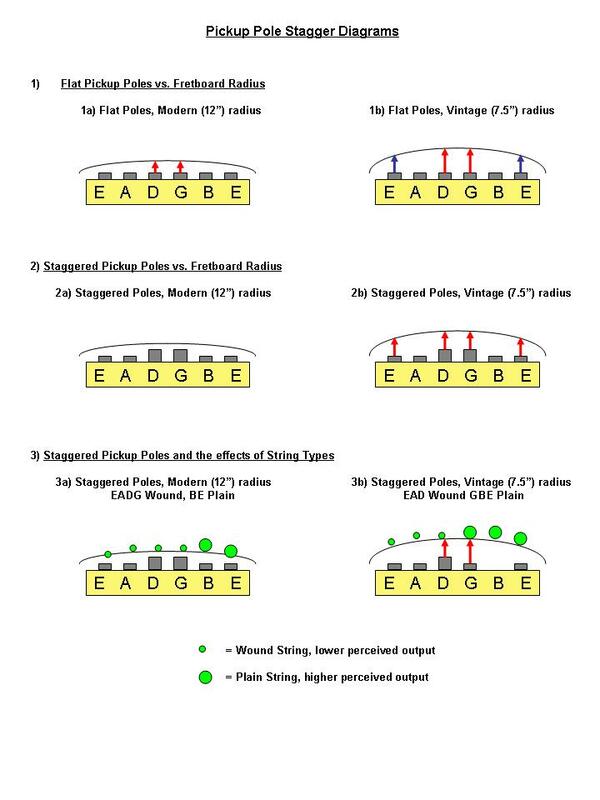 Beginning with a definition; polepiece stagger is simply the relative heights of the 6 polepieces across the surface of a pickup (focussing here on standard Fender 6 string guitars). By altering the relative heights of the polepieces, the distance between them and the guitar strings is changed. The smaller the string-to-pole gap, the louder that string will sound in a strummed chord for example. Pickup polepiece configurations fall into 2 basic groups; a ‘flat’ layout with no stagger, and then varying degrees of stagger normally with the D&G poles higher than the other 4 poles. The later is simply a ‘mechanical’ way of matching the string to polepiece distance against the string arc pattern that naturally forms when string 'action' is itself adjusted to follow the contour or radius of a fretboard. Early Fender’s used 'low' radius fretboards, typically 7.5”. This makes them much more curved than typical modern 12” radius guitar fretboards, as will be the consequent arc the strings will be adjusted to. Staggered polepieces on pickups were standard on Stratocasters when they were launched in 1954, and stayed that way until 1974 when flat profiles were introduced, only to revert to staggered designs in the early 80’s. The Telecaster has also had changes in this area, starting with a flat (and flush to the pickup top surface) polepiece profile, before receiving staggered polepieces in the 1960s. In the diagram section 1, the impacts of the 2 differing fretboard radii are shown relative to a flat pole profile pickup (note the diagrams are illustrative, not accurately to scale). In diagram 1a), the distance between any pole and the string in the arc above it is not identical, but relatively constant. So if an E Major chord was strummed, the 6 strings (assuming they were all of the same construction) should sound similarly loud in the mix. But in 1b), the vintage radius means the D&G poles are much further away from the strings than the two E poles, illustrated by the different lengths of the blue and red arrows. So in that same E chord, the D&G strings would be at a lower relative volume in the mix compared to the treble and bass strings. A simple way to mitigate against this is to alter the pole heights, and section 2 shows the impact of a doubling in height of the D&G poles. Against the modern radius fretboard, the poles are now getting very close to equi-distant from the strings. On the vintage layout, the distances between the two E strings and poles is now the same as the D&G pole-to-string gap (the four red arrows are all the same length). The term ‘Vintage Stagger’ is loosely accepted as meaning raised D&G poles. So far so good, but all of the above assumes that the six strings are equal, i.e. for a given pluck they all produce the same vibration and thus pickup output. When the Stratocaster was introduced in 1954, light-gauge and round-wound guitar strings did not exist. At that time, the third string (G) was flat-wound like the E, A and D strings. The ability of a string to generate pickup volume is a complex blend of string mass and tension, but wound strings generally have a lower output than plain strings (the pickup reacts primarily to the core of the wound string). So the B&E poles, (whist still following the string arc), would be expected to be a fraction lower than the other (wound strings) poles for volume compensation. Over time, the G string more popularly became a (higher output) plain string, so the G pole was lowered to accommodate that. The final diagram 3b) illustrates a ‘hybrid’ of the original vintage stagger but with the G pole lowered for the modern plain G string (plain GBE strings). The B pole has also been lowered in this example (flush to the pickup cover as some Fender designs) as a way of ensuring it does not overpower the mix, and allows the treble E a little more presence (useful with higher resistance pickups that tend to ‘self-filter’ treble content). In summary then, the changes over time in fretboard radius, string configuration and development (e.g. brighter flat wound strings), have all played a part in causing pickup designers to adopt various stagger and flat pole piece profiles. These are all of course compromises given the huge range of variations in guitar available, and, within limits, adjusting the overall height (and tilt) of any pickups also has a significant effect on altering tone and relative volume (see the Ironstone guide to Guitar Pickup Adjustment). The majority of the Ironstone Stratocaster & Telecaster pickups feature a very light ‘vintage stagger’, i.e. slightly raised D&G poles along the lines of diagrams 2a) and 2b). These are applicable to most fretboard radii and string sets. The Ironstone ‘Hybrid’ Stratocaster pickups use a more pronounced pattern similar to 3b), offering a greater level differentiation between relative string volumes. Hopefully, that has clarified some of the science behind the ‘myths’ and demonstrated how historical change has led to today’s pickup diversity.